- Not staining. Once it's off by contact (kissing a cup, wiping off with a tissue, etc), the lips will return to natural colour. 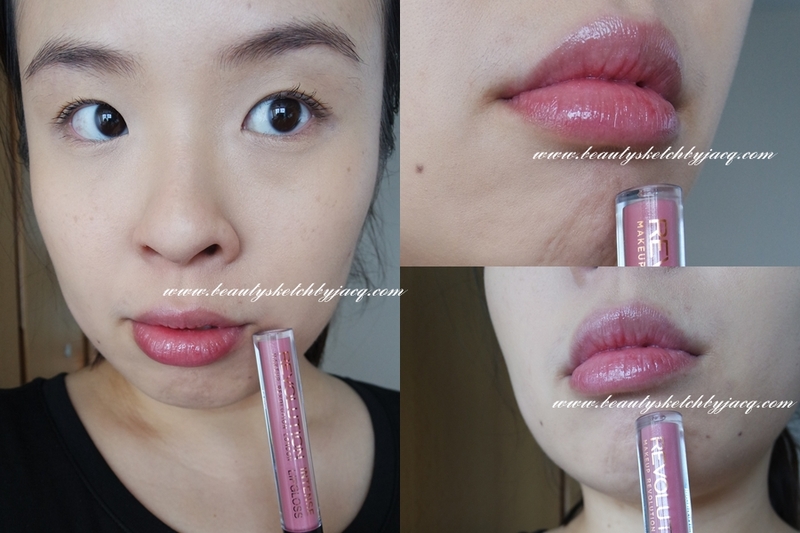 - The applicator dispenses very little amount of product each time so for the size of my lips I have to re-dip 5 times+. - Doesn't bleed although it is not sticky at all. - I actually find this formula surprisingly positively impressive. Sadly I rarely do a pigmented glossy lips, especially not red, so I'll probably not be keeping and using this. 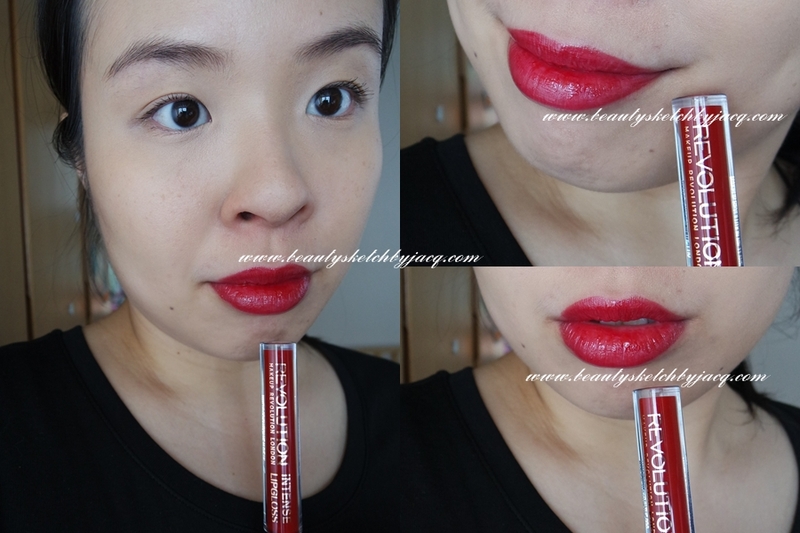 - It is the more 'expensive' (2.5 pounds) lipsticks from MU Revolution. 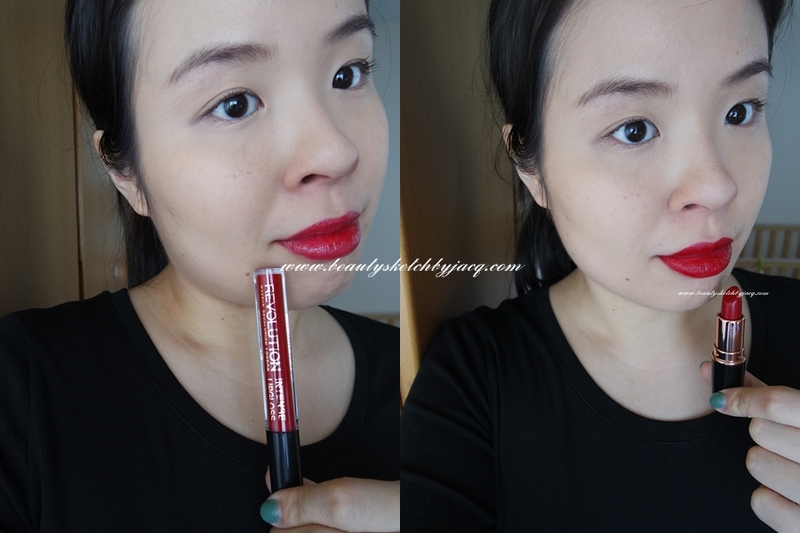 The Amazing Lipstick (1 pound) I have not tried. - Shade is a cool red with more depth than the lipgloss. - Very creamy and pigmented. - Wears for a long time, and amazingly comfortably. 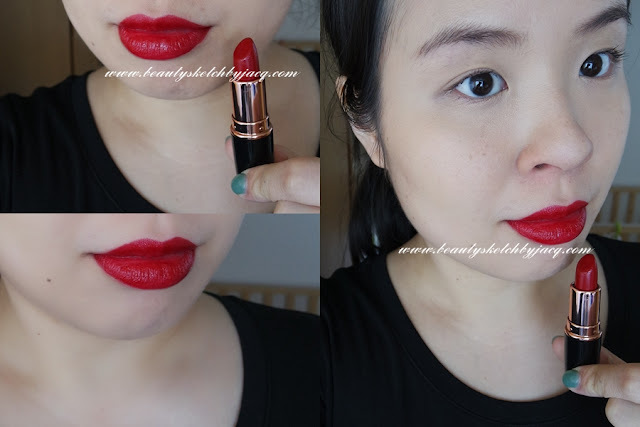 - If not for the smell, this can become one of my favourite affordable red lipsticks. Sorry. My nose doesn't like you. - Recommend if you're not easily disgusted by plastic-like vanilla fragrance. - Not sure I'll ever use it as I am getting soak-off gel nails done regularly, and I do not want to risk the health of me & my babies by trying nail polishes. Another set I got is the Makeup Revolution Be Revolutionary Bag Set - Heroine. Which was marked down from 8 to 5 pounds, but now sold out. It came with an eyeshadow palette with seven shades, a lipgloss and a rose gold make up bag. - mine came slightly shattered (my sister's luggage broke) and I do not wear eyeshadow very often now. But given my previous experience with MU Revolution eyeshadows (I got a Run Boy Run from +Cynthy), the pigmentation and formula of the metallics are great. The 2 matte shades swatched are on the chalky, but still rather smooth, side. Have you tried Makeup Revolution products before? What's your ultimate favourite from their line up?